Gary the Snail – From SpongePedia, the biggest SpongeBob-wiki in the world! Gary the Snail is one of the main characters of the series. He is SpongeBob's pet sea snail who is voiced by Tom Kenny. Gary can only speak in a "meow" noise, while sea worms in the show commonly bark which indicates that snails are the ocean equivalent of cats and worms are dogs. In some episodes Gary has been known to say something other than "meow" but this is rare. Gary is the tenth main character of the show. In Opposite Day Gary attempted to do the opposite of his stereotypes by barking like a dog. In The Secret Box, Gary responded to SpongeBob's question with "Meow-no". SpongeBob didn't think much of it and replied "Aaw, what do you know? You're A Snail!" SpongeBob didn't recognize it as special meaning this isn't the first time Gary spoke. In The Movie, The Citizens of Bikini Bottom were chanting "All Hail Plankton", while Gary chanted monotonously "Meow Plankton". In many episodes, it has been indicated that Gary is very intelligent, the biggest hint of which was in Sleepy Time where Gary spoke in his dream (that SpongeBob was intervening) and sounded very old and wise. He had an extensive library which is a possible metaphor for intelligence. Typically, because he is smart, he is not very athletic and constant exercise and physical work makes him tired and wheeze meaning he is a possible asthmatic. He is a domesticated house pet with similar mannerisms to a cat but also is said to be royal blood as seen in Rule of Dumb. Curiously in Rule of Dumb, it proves that Gary and Patrick are cousins, as their Fathers were brothers. It is suggested that SpongeBob had Gary when he lived with his parents as a young boy. As seen in Gary Takes a Bath, Gary can levitate and teleport, possibly meaning that psychic powers run in the Star family, as Patrick also has psychic abilities. Gary didn't appear again after the episode: Help Wanted until the episodes, Plankton! and Boating School. Gary has been to many places including the large Bass Vegas. Gary had a very minor role in the episode, Atlantis SquarePantis, but all of his family and relatives who were partying with him are shown. Gary was seen blowing on a happy birthday paper flute and was wearing a party hat. Gary is also a very good musician, although he wasn't part of Squidward's band in the episode, Band Geeks. In The Paper, he played Squidward's Clarinet very well, and Squidward was confused by this. In Procrastination, Gary played the trumpet. In Something Smells, Gary played the violin to make SpongeBob cry while chopping onions because SpongeBob told him to. Gary is usually left home all alone very numerously, and it seems that he's always okay. However, in Have You Seen This Snail? he couldn't. Sometimes, he is very lonely. In The SpongeBob SquarePants Movie, he was left alone for probably a whole week, after the morning when Plankton was being arrested, but in Have You Seen This Snail?, he suffered hunger for 10 days and 1 night. In the episode, Clams, he was left out for 3 days, and ate the sofa. Gary hates taking a bath as seen in Gary Doesn't Take a Bath and Pet Sitter Pat. In the second one, Patrick wants to wash gary. SpongeBob used many methods like Free Dollar, Boomerang Pet Ball, etc. Jellyfish Jam: Gary's eyes produce musical sound which is used to calm the jellyfish. The sound also plays a part in the symphony in the same episode. I Was a Teenage Gary: Gary is the main character in the beginning and middle. At the end, it belongs to SpongeSnail. Dumped: Gary runs away home to Patrick Star in order to get the cookie out of his pocket than be with SpongeBob. Gary Takes a Bath: Gary tries to escape SpongeBob's plans to get him clean exactly quick. The Great Snail Race: SpongeBob becomes a strict ditactor and is obsessed in winning the race trophy with Gary's body. Once Bitten: Gary is infected by Squidwárd's lousy wooden log, and bites Bikini Bottomites including SpongeBob! Fungus Among Us: Although Gary is not the main protagonist, he does make the solution by eating away the Ick. Shell Shocked: Gary's shell has broken and SpongeBob needs to find him a new one. Gary in Love: Gary falls in love with a snail called Mary. In I Was a Teenage Gary, the ignorant Squidward lied to SpongeBob that he would feed Gary, who nearly died of hunger and thirst. In The Great Snail Race, he raced against Squidward's snail, Snellie. In Once Bitten, Squidward made lots and lots of Anti-Snail wooden logs. A log got inside Gary's foot and he got a splinter. Gary went out of control because the splinter or log really hurt, and bit Squidward. In The Thing, it is revealed that Gary attacked Squidward and nearly killed Squidward too. When Squidward turned into the thing, Gary nearly killed Squidward again. In Can You Spare a Dime?, Gary calls Squidward a big loser as Squidward calls him other bad names. In Patty Caper, when SpongeBob blames Gary for supposedly stealing the secret ingredient to the Krabby Patty, Gary describes another suspect-- Squidward, and, based on the picture Patrick had drawn of him, Gary must think Squidward is very ugly. Gary is vaccinated for Rabies, Snail Pox, Soft Shell Dance, Bagitis, Lumpy-Bump Trump and Teen Angst. In All that Glitters, it is shown that Gary has a large diamond under his shell. In Your Shoe's Untied, it is shown that Gary has a record player under his shell. In Karate Island, when SpongeBob is waxing Gary's shell, he finds his favorite novelty t-shirt that says "I love Krabby Patties" under his shell. In The Inside Job, it is revealed that Brain Gary lives in SpongeBob's brain. 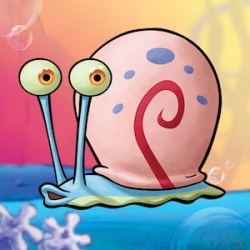 Gary's favorite food is Snail-Po which SpongeBob once tasted. Also in Your Shoe's Untied, Gary is revealed to have feet. Gary can say the words "Plankton","yeah!" and "No"
Also to illustrate Gary's antagonism towards Squidward, in I Was a Teenage Gary, when SpongeBob answers the door, to Squidward, holding Gary, Gary hisses at him. Gary has arms as seen in Have You Seen This Snail?, The Gift of Gum, and Grooming Gary. In Rule of Dumb, it is revealed that Gary is the king of Bikini Bottom. In Your Shoe's Untied, Gary roars like a lion once. This page was last modified on 6 April 2019, at 00:32. This page has been accessed 135,257 times.